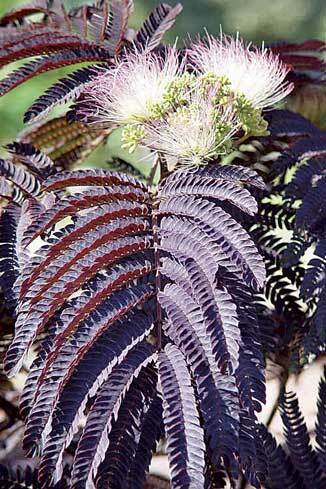 Also called the Mimosa Tree and the Persian Silk Tree, the Albizzia has intensely ferny foliage with a rich burgundy colouring in the heat and sun. Will grow to 6-9 m with a wide spread. Fluffy flowers come in clusters; thin pink flushed looking like the fuzz of silk. Copes with hot dry sandy conditions. Perfect for our climate. From a large family of ornamental trees useful for commercial timber, shade and shelter, this Gum has wonderful red flowers which provide a real blaze in late summer. The flower colour cannot be guaranteed and may vary from crimson to orange-scarlet and sometimes white. With its statuesque grandeur this tree is the most striking of the family and grows to 3-9 m. Young plants may need protection from frost. we have some treasures for you…..
All available from Eugenie NOW !